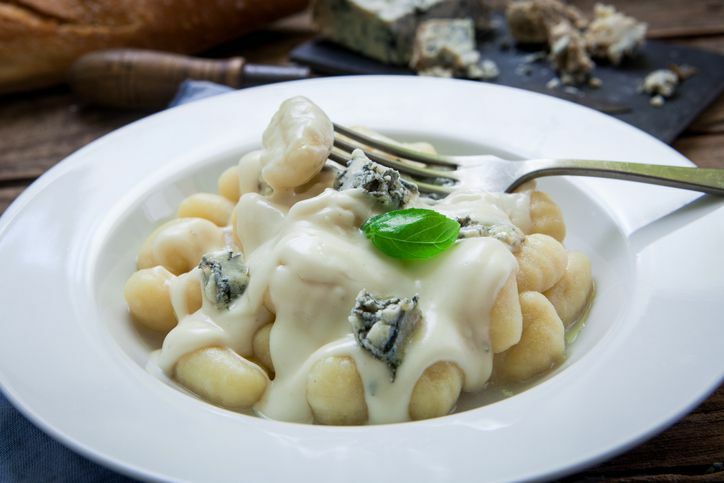 This Gorgonzola sauce for pasta is a bit like a classic white wine sauce, only instead of being thickened with roux, like a velouté- or béchamel-based sauce, it's thickened solely with cream and the cheese itself, and by reducing it. This makes it a rather magical sauce indeed, since most of the time you make a sauce, you have to make a roux, and so your guests will be astonished to see you whip up a sauce that holds together without having to go through the old flour-and-butter routine of making a roux. Speaking of gluten, this sauce is amazing served with pasta, ravioli, or gnocchi. But if gluten isn't your cup of tea–or if you simply love steak–this Gorgonzola sauce is a wonderful accompaniment for a grilled ribeye. This Gorgonzola sauce is best made with aged Gorgonzola, which is drier, more crumbly, and a great deal more flavorful than the younger kind because its flavors intensify as it ages. In a large sauté pan, heat the cream, wine, and stock over medium-high heat until it starts to bubble. Lower heat and simmer gently for 15 to 20 minutes or until the liquid has reduced by about one third. Add the Gorgonzola and Parmesan and stir until the Gorgonzola has melted and the cheeses are fully blended. Adjust consistency with additional cream if necessary. Season to taste with kosher salt, freshly ground black pepper, and freshly grated nutmeg. Go easy on the nutmeg, though, as too much can be overpowering. Serve right away.